Neato. Nice aesthetic. And I thought the "any key to hack" was pretty funny. We apologize if the objective is unclear. 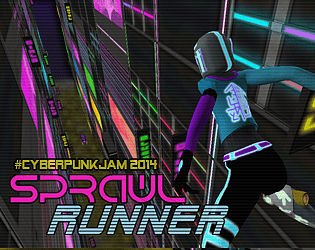 SprawlRunner is an endless runner, in which your objective is to hack the billboards (purple, orange, green and blue) by mashing keys whilst running over them. Occasionally, if you avoid enough obstacles, you will reach a bonus hackable vehicle, which you can score bonus data from to increase your overall score. Unfortunately I also didn't understand what to do, even after many replays. It seemed the only way I could avoid 'dying' was to spam spacebar. Up/Down seemed to have little effect. Spamming any keys to hack felt like the opposite of hacking. The character was my favourite element. careless labs, a simple reload should do the trick, it seems to be a problem with the unity plugin more than anything. Also had some trouble figuring out what was going on for a while, but once I got the hang of it it was enjoyable. Wont get passed the loading screen, anything I can check? Good idea, but the dialog was so full of slang that I had a hard time understanding what it was trying to say which meant I had an even harder time figuring out what to do and what was going on. Also being bounced so harshly back and forth between both sides was very visually jarring. Would be much better if the camera was fixed in the middle so the player can jump back and forth without the camera having to move. Decent game though. I see potential with the concept!